This numerical tour explores the use of L1 optimization to find sparse representation in a redundant Gabor dictionary. It shows application to denoising and stereo separation. 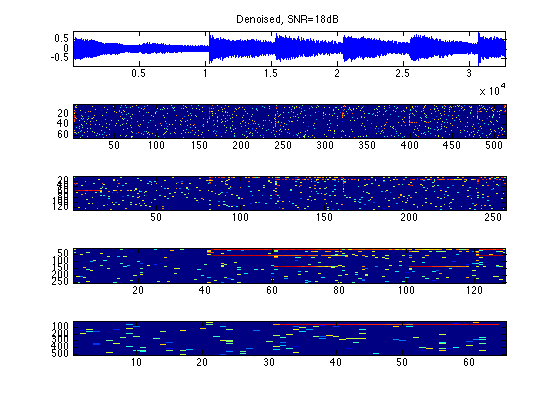 The Gabor transform is a collection of short time Fourier transforms (STFT) computed with several windows. The redundancy K*L of the transform depends on the number L of windows used and of the overlapping factor K of each STFT. We decide to use a collection of windows with dyadic sizes. Overlap of the window, so that K=2. Approximate redundancy of the dictionary=8. Compute its short time Fourier transform with a collection of windows. Exercice 1: (check the solution) Compute the true redundancy of the transform. Check that the transform is a tight frame (energy conservation). True redundancy of the dictionary=8.0586. 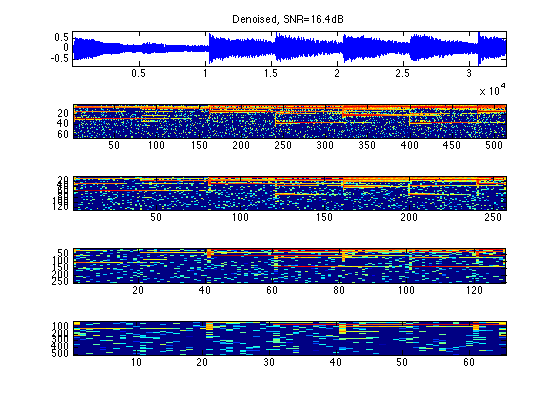 Reconstructs the signal using the inverse Gabor transform. We can perform denoising by thresholding the Gabor representation. We add noise to the signal. Denoising with soft thresholding. Setting correctly the threshold is quite difficult because of the redundancy of the representation. Exercice 2: (check the solution) Find the best threshold, that gives the smallest error. Since the representation is highly redundant, it is possible to improve the quality of the representation using a basis pursuit denoising that optimize the L1 norm of the coefficients. 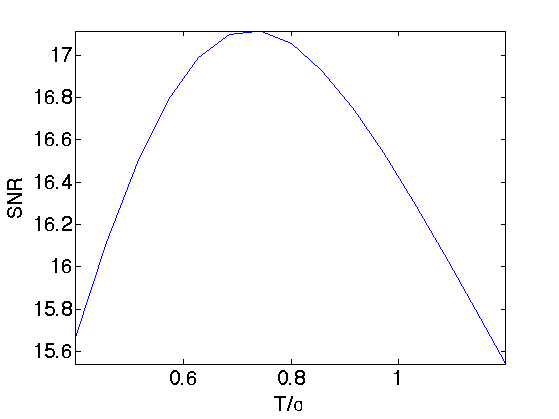 Where x1 is the signal reconstructed from the Gabor coefficients S1. The parameter lambda should be optimized to match the noise level. Increasing lambda increases the sparsity of the solution, but then the approximation x1 deviates from the noisy observations x1. Basis pursuit denoising (*) is solved by iterative thresholding, which iterates between a step of gradient descent, and a step of thresholding. Initialization of x1 and S1. 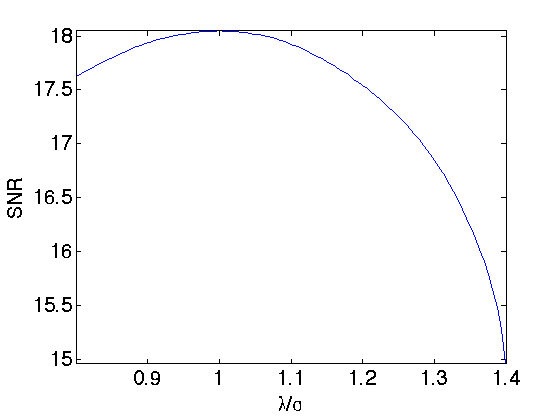 Step 1: gradient descent of norm(x-x1)^2. Step 2: thresholding and update of x1. The difficulty is to set the value of lambda. If the basis were orthogonal, it should be set to approximately 3/2*sigma (soft thresholding). Because of the redundancy of the representation in Gabor frame, it should be set to a slightly larger value. Exercice 3: (check the solution) Perform the iterative thresholding by progressively decaying the value of lambda during the iterations, starting from lambda=1.5*sigma until lambda=.5*sigma. Retain the solution xbp together with the coefficients Sbp that provides the smallest error. Display the solution computed by basis pursuit. 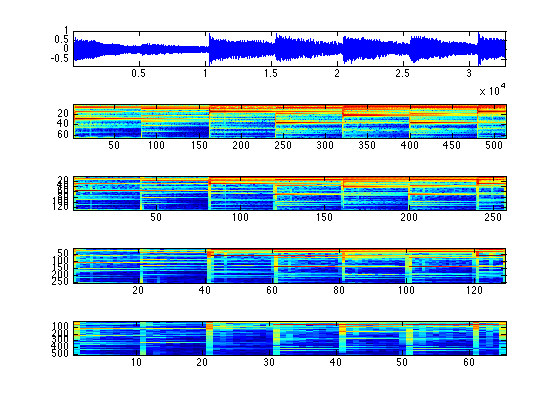 The increase of sparsity produced by L1 minimization is helpful to improve audio stereo separation. We mix the sound using a 2x3 transformation matrix. Here the direction are well-spaced, but you can try with more complicated mixing matrices. We transform the stero pair using the multi-channel STFT (each channel is transformed independantly. Reconstruction error (should be 0)=1.5966e-16. Now we perform a multi-channel basis pursuit to find a sparse approximation of the coefficients. Replication factors must be a row vector of integers or integer scalars. Create the point cloud of both the tight frame and the sparse BP coefficients. Display the two point clouds. Compute the angles of the points with largest energy. Compute and display the histogram of angles. We reaint only a small sub-set of most active coefficients. Exercice 4: (check the solution) Compare the source separation obtained by masking with a tight frame Gabor transform and with the coefficients computed by a basis pursuit sparsification process.